Apart from for citizens of Japan, Singapore and Brunei, all visitors to China require a visa. Allow plenty of time to obtain the visas in order to avoid last minute panics and embassy express fees! a) Applicants are required to provide documents showing the itinerary including transport record and proof of hotel reservation, etc. Completed Chinese visa application form A and B with clean and tidy hand-writing, one colored passport photo taken in the last six months. 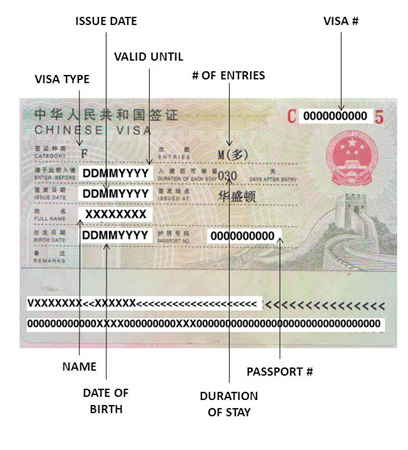 b) A 30-day visa is activated on the date you enter China, and must be used within three months of the date of issue. Sixty-day and 90-day travel visas are less likely to be issued. Documents on the commercial activity issued by a trade partner in PRC are required (e.g. trade fair invitation or other invitation letters). b) Information of the planned visit (purpose, arrival and departure dates, destination, relationship with the inviting entity or individual, and also the financial source).